These links open on another page on our website. Shipping and Handling Information about our S&H rates, shipping upgrades, and international shipping. This is on another page on our website. NOTE: During our busy months of August to October, order processing may be delayed due to the high volume of orders. It’s our goal to process orders as quickly as possible, but sometimes we have a run on certain popular products and have to restock which can take a few days. Hope you understand. Online ordering is easy with our secure shopping cart. There’s an “add to cart” button by each item on our website. If you want to order more than one of a particular item, you can adjust it in the view shopping cart area. Simply change the quantity of the item you want and click the “Recalculate” button. When you are ready to place your order, click the “Check Out” button. 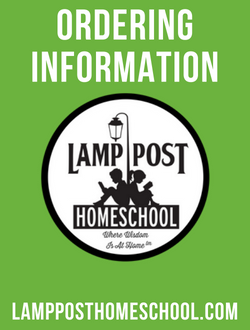 You don’t have to log-in to check out at Lamp Post. If you want our shopping cart to remember your information for future transactions, you can select that option after you fill in your billing information. Our usual shipping method is by USPS media mail. If you faster shipping than USPS media mail, you can order a shipping upgrade. Please call us to place rush orders or if you need to make sure we can meet your deadline. Please call 800-326-9273 (or 570-435-2804) to order by phone. We accept MC, Visa, and Discover. 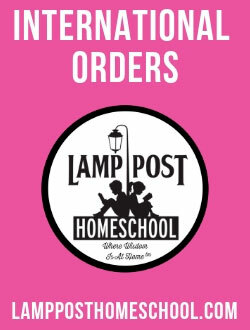 When you call to place your order, you will hear a real homeschooler. We can tell you immediately if your items are in stock (we check while you are on the phone!) Our goal is to ship your order as soon as we can if the item is in stock. We do answer curriculum questions, but ask that you please use 570-435-2804! Please leave a message if you get the answering machine. We offer personal service and will call you back as soon as possible — we homeschool too! 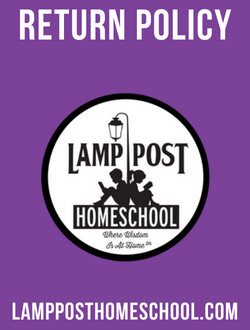 Print a Lamp Post Homeschool Order Form. TIP: You can use our online shopping cart to choose your items. Then go to check out. You can type in your name and address on the online form (or fill it in by hand after you print it, if you prefer). Print the order form. Then mail it with your check or money order. If you cut and paste the order form into an email, you can notify us that your payment is coming. Then we can have the items ready for your order. We suggest that you have a back-up for your e-book file. E-books are non-returnable for obvious reasons. If you need help, please give us a call or send an email. We accept Visa, MasterCard, and Discover online and in our store. By mail, we also accept Money Orders and checks. In addition, if you check out with PayPal, we also accept PayPal, e-checks, and the following credit cards. If a product is out of stock, we may split the shipment (at our option and at no extra charge to you) and send the back ordered item as soon as it is available to us or if it’s expected within one week, we’ll hold the order and ship everything together. When an item is back ordered for longer than 3 weeks, we will contact you to discuss your options to backorder or cancel that item. Occasionally items go out of print and in that case, we will cancel that item and send the rest of your order, refunding the price of the canceled item and adjusting S&H, if applicable. 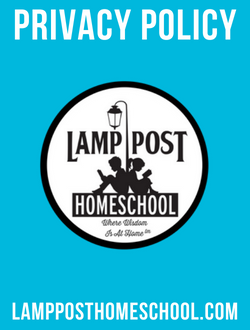 You won’t be missing any homeschool specials (with a very few exceptions) at Lamp Post Homeschool Store. Why? We discount our prices year round, where publishers allow. It takes the pressure off of you to make purchases in a hurry and gives everyone the best price we can offer all year long. How long do our sales last? Unless there is a time limit noted on the page, we will keep those sale prices all year long or until the publisher changes its prices. Usually, that is once a year or less. Publishers tend to change prices in January to March or around September. Some companies do not allow their products to be discounted and we honor their wishes. Thanks for understanding. All prices shown are in US dollars and the currency of all transactions is in US dollars. Please note that prices are subject to change without notice. We try our best to have the correct prices; however, we receive notices year ’round from our publishers about price changes. Pennsylvania residents, please add 6% sales tax on the total including shipping and handling. We accept purchase orders from schools in the U.S by fax or by email in PDFs, subject to verification. Please use the SH Table for Purchase Orders on the Shipping Rates Page to compute the SH. In the majority of orders on the evening of the day we ship your order, we’ll send you an email with a Delivery Confirmation Number. When the order is shipped via USPS Media Mail, it allows for some tracking along the way when the post office scans it—which they usually do at the larger distribution centers. If you ordered an upgrade to USPS Priority Mail or FedEx Ground, then you’ll get full tracking information. The exception to this is when we drop-ship an item from a publisher to save time for you. In that case, tracking isn’t available to us for several days and by then, the package has probably been delivered. Please feel free to send us an email inquiry [Contact Us] and we’ll respond as soon as we can, but typically by the next business day at the latest. Or give us a call at 570.435.2804 or 800.326.9273 and ask for Wynne, the Shipper Guy!